A carved and painted altarpiece from Chur Cathedral in Switzerland dating from the Late Middle Ages. An altarpiece is a work of art that has been made to go above the altar in a Christian church. 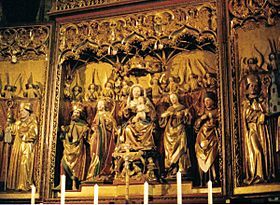 An altarpiece can be a painting, or it can be carved from wood or stone. Some altarpieces have both painting and sculpture. What is an altarpiece for? A beautiful altarpiece is a way of making a person who goes into a church feel interested, so they walk forward, closer to the altar. This puts them in a good position to see the church service, hear the prayers and readings, and listen to what the priest says. If there is no service in the church at that time, the altarpiece gives a person something interesting to look at and think about. It helps them to think about Jesus or a particular saint whose story might be told in the pictures. Looking at an altarpiece can encourage a person to pray. There are three most common subjects, The Virgin Mary and Christ Child, Jesus crucified and Christ in Glory. These are three very important parts of Christian belief. Altars of The Virgin Mary and Christ Child were made to remind Christians that God came to Earth as Jesus, in the form of an ordinary helpless little baby, to grow up among people. These altarpieces are to remind Christians of the Christmas story. Altarpieces of Jesus on the cross were made to remind Christians that Jesus, who was pure and did not sin, died a horrible death like a robber and murderer so that Christians could be forgiven. These altarpieces are to remind Christians of the Easter story. Altarpieces that show Jesus sitting on a throne in Heaven were made to remind Christians that they need to put their lives right and turn to God because one day they will see him on his throne. These altarpieces are to remind Christians that they never know when their life might end and they should live every day in a way that pleases God. Many altarpieces, as well as having one of the three main scenes, may have lots of other figures or lots of other small scenes. The other figures are usually saints. They might be shown standing around a throne where the Virgin Mary sits with Baby Jesus on her knee. Or they might be painted on separate pieces that are joined to the middle part of the altarpiece. These saints do not have to be people who were alive at the same time as Mary. They are more often the patron saint of the church or the favourites saints of the person who paid for the altarpiece. Smaller rectangular parts of the altarpiece often have stories painted in them. They may be stories from the Bible telling the life of Jesus, or they might tell the life of a saint. 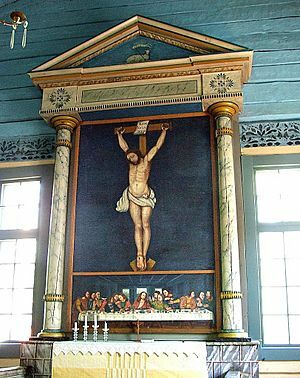 An altarpiece can be as small as a tiny painting put on the wall above a table in someone's home. Or it can be so big that it fills the wall of a huge cathedral. The word is usually used for artworks which are quite big. A small painting may be called a Holy Picture or an Icon. 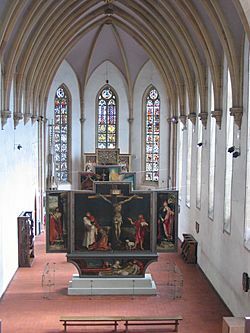 The chapel of Unterlinden Museum with The Isenheim Altarpiece. The Isenheim Altarpiece in Colmar, France was painted by a German artist, Matthias Grunewald. At the centre is a terrifying and horribly real scene of Jesus on the Cross. Other scenes show the joy of Jesus' birth and the glory of him rising from the grave. The Ghent Altarpiece in Ghent Cathedral, Belgium, is a wonderful painted polytych. This means it is in lots of pieces which are hinged and can be closed. It shows Christ in Glory and has many beautiful figures which include Adam and Eve. It was painted by Jan and Hubert van Eyck. The Great Screen of Winchester Cathedral is a huge carved altarpiece made to replace an ancient one that was ruined in the 1600s. It has Christ on the Cross at the centre, surrounded by rows of carved saints. There is another altarpiece like this in Southwark Cathedral, London. The Maesta painted by Duccio which is no longer in Siena Cathedral in Italy but is now in the cathedral's museum. This altarpiece has the Virgin and Child at the centre, surrounded by rows of saints. On the back were many small pictures telling the story of Jesus, but they have all been taken off and are shown separately. The Transparente in Toledo Cathedral in Spain is an amazing sight. It is a huge altarpiece caved of white marble with gold decoration. In the roof above it, there is a hidden window which lets bright light shine in to light it up. Altarpiece Facts for Kids. Kiddle Encyclopedia.